Disney World machines all cost the same: 50 cents plus your penny for pressed cents; 75 cents plus your dime for the dime machine (only one exists – at Space Mountain); $1 in quarters plus your quarter for pressed quarter machines. Penny press books are available at many Disney World stores, but not all stores. New designs are introduced every two or three years. Current price (2015): $8.95. There are several types of machines. The most common are 3-die electric button machines and 4-die hand-crank machines. 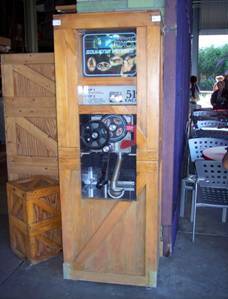 Single-die machines are being phased out, but there are a few left (mainly quarter machines – but also a penny machine at House of Blues – Downtown Disney). They are usually placed into themed cabinets. In addition, Chase machines can be found at most resort hotels near the lobby area. At Fort Wilderness, the machine is near the rest rooms at Pioneer Hall. Some stores and attractions close early (such as Fulton’s General Store at Port Orleans, and the water parks). Other locations are open until 11pm or midnight (such as food courts, Downtown Disney and mini-golf). Parking: Parking costs $17 a day for the 4 main theme parks (2015 price). In-and-out privileges are offered for all parks; for example, if you pay to park at Epcot, you can also park at the Magic Kingdom later that day by presenting your parking receipt. Resort guests are entitled to free parking at the parks, but they need to get a parking pass at the hotel desk. ESPN Wide World of Sports normally offers free parking, but during some events (notably Atlanta Braves spring training) a parking fee is charged. All other areas of Disney World (hotels, campground, Downtown Disney, water parks, mini golf) offer free parking to everyone. Hotel resorts & campground: You can enter all the hotels free of charge to go shopping, dining, or press pennies. If you drive there, you will be stopped at the front entry gate and need to present picture ID to security. Explain why you are there, and you will be permitted to come in. They are mainly concerned about people parking at the hotels to get free parking (instead of the $17 per day the 4 main parks charge for parking). At Fort Wilderness campground, you park in front and take a bus to Pioneer Hall and the trading posts. Parking: free. ESPN Wide World of Sports: This sports complex is open seasonally. Check the Disney website for operating schedules. 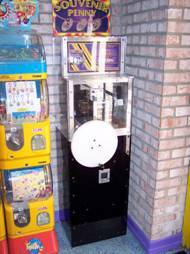 You do not need to pay admission to enter the store where the machine is located. Parking: ESPN Wide World of Sports normally offers free parking, but during some events (notably Atlanta Braves spring training) a parking fee is charged. Boardwalk: The Boardwalk area does not charge an admission fee. Parking: free. Downtown Disney: All machines can be accessed without paying for admission. At Disney Quest, three out of four machines are located in the “pay for admission” areas. Parking: free. You can always get pennies at any store or restaurant. They will search for shinier coins – it’s part of Disney’s legendary service. That legendary service has its limitations, though - Disney cashiers have generally been limiting quarters to $2 or $3 increments. 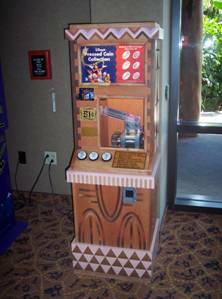 Here is an incomplete list of DISNEY WORLD CHANGE MACHINES – the machines give quarters, and no other types of coins. They generally take currency from $1 to $10 bills. 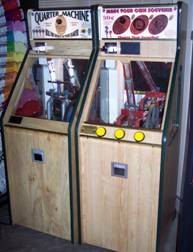 Hotels generally have change machines near their arcades, but not all hotels have arcades or change machines. Copper coins give a better impression than copper-coated zinc coins because there is no streaking of the two metals.